What could be better than combining two of Americans’s favorite pastimes, baseball and hanging with your canine? The good news is that is already a reality at a number of dog friendly Major League Baseball parks around the country. These are special promotional events (Bark in the Park, Pup Night, Dog Days of Summer) that allow you to bring your dog with you. All of these events pretty much share the following: 1. you need to buy your tickets in advance online; 2. you need to sign a waiver; 3. you need to bring proof that your pooch is vaccinated; 4. it’s one dog per one human; 5. you and your pooch will need to sit in a specific area of the park; 6. Fido needs to be on a leash; 7. you are not allowed to bring puppies (4 to 6 months is usually the age minimum). 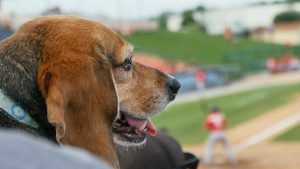 For these events, these dog friendly Major League Baseball parks usually have a vet on hand (just in case) and provide a designated comfort area for your dog. Here are the pet friendly American League and National League baseball teams with dog days on their 2018 schedule. Oh, and one last thing–these events sell out quickly, particularly for teams that only offer the event for one or two games through the whole season, so get online and get your tickets asap. And if you’re traveling when you go to one of these games, be sure to use Petswelcome to find just the right pet friendly lodging. The Sox offer a single Dog Day in 2018, on April 23, vs. the Seattle Mariners. For the Royals’ dog friendly Bark in the Park promotions, your buddy gets a free aluminum dog bowl and $5 of the ticket price is donated to the Greater KC Humane Society. Seating is in the lower level left field corner. The ticket price of $45 admits one human and one canine. For Bark at the Park promotions, $50 admits one adult human and one dog. The pet friendly Diamondbacks do up their Dog Days of Summer right. They have a PetSmart Patio, with cafe tables, with one dog allowed per table. Your ticket price entitles you to all-you-can-eat/drink hotdogs, popcorn, peanuts, chips, soda, and water. The one hitch is that you must buy a block of 4 tickets (there are 4 chairs to each table) to participate, which runs $160, but strikes us as pretty fair, considering what you’re getting. Behind the Patio, there is the PetSmart Park, a combination outdoor and air-conditioned indoor play area for your dog, where they can run around or cool down. The outdoor portion is landscaped to look like a baseball diamond, including a grassy outfield. Get your tickets asap for Atlanta’s one Bark in the Park promotion, on May 20, against the Miami Marlins. The human ticket is $22, the canine ticket $20 but it does come with a complimentary 5-foot leash emblazoned with the Braves’ logo. Seating is in the Xfinity Rooftop. For the Reds’ Bark in the Park promotions you can buy a single ticket for $50, which will admit one human and one dog, or buy a Bark in the Park season pass for $160. Seating is down the first base line and, weather permitting, there will be a Pet Parade before the game. The Rockies offer a single Bark in the Park promotion, on August 22, against the San Diego Padres. In LA, it’s Pups in the Park, and you’ll be seated in the Right Field Pavilion. Tickets are $46 for humans and $40 for Fido; a portion of the ticket price will be donated to Tony LaRussa’s Animal Rescue Foundation. Seating for the Mets’ dog friendly Bark at the Park will be in the Coca-Cola Seats, and a portion of the ticket price will go to the North Shore Animal League America. Weather permitting, you and your pooch can participate in a Dog Parade before the game. They may be towards the end of this list but the Pirates’ are the most dog friendly Major League Baseball park of them all. For the 2018 season, every Tuesday home game is Pup Night at PNC Park. Their Dog Package is $36, which admits one human and one canine. Seating is in the rooftop section. Get your tickets quick, because the Giants are offering just one Dog Day of Summer this season, August 26, vs. Texas Rangers. Again, get online and get your tickets now, there is just one Pooches in the Ballpark promotion, on May 5, vs. Chicago Cubs. In addition to being able to bring your best buddy, they’ll be giving away a pet treat container emblazoned with the Cardinals’ logo to the first 30,000 fans. It’s Pups in the Park in D.C. You can buy your tickets singly or buy a “six-pack” season pass. (It’s sponsored by Budweiser, get it?! Yeah, we know it’s silly but we still like it! ).